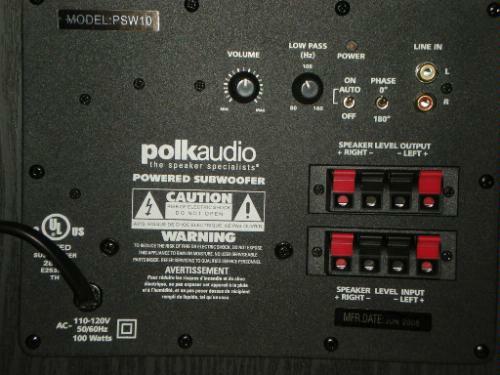 Polk Audio PSW10..............what do you think? I have a room that is roughly 12x19 feet. I am running a Denon AVR-S730H, two pairs of Polk T-15's, a T-30 center channel speaker and I'm looking at a sub. Ultimately I'm going to go Atmos, but for now a sub is the next addition. It's hard to beat for the $$$ if it's anything like the T-series speakers I own. Anything I'm not considering here? It seems like a good fit! I think you should up your budget and get a good sub. I don't understand. Are you saying that is not a good one? The PSW-10 presents good value, but you can go up a hundred bucks or two and get something a thousand times better. And if it was any more expensive, it could probably be considered junk. It could probably be considered trash now TBH. Looks like you’re building a HT set up. The PSW 10 doesn’t have an LFE input. This is the .1 channel, and it is a recognized channel in the sound mixing process. Your AVR is designed to send that signal, this sub doesn’t have the input to receive that information. Specs say it can dig to 35Hz. Not good at all for HT duty, and barely acceptable for a budget music based system. No, I do not consider the PSW 10 a good subwoofer. You can get much better subs for not much more. The above mentioned PSW 505 is much better choice, for not a lot more. It has the LFE input, and the specs say it will dig down to 23 Hz. You will hear many more explosions with it. It’s a pretty good budget sub. Those 2 reasons alone should have you considering a larger investment in a sub. @rpf65 I agree with your comments regarding performance, but the PSW 10 clearly has a LFE input. Guy at work asked me what LFE was 3 or 4 weeks ago. Said he was looking at subs, and a review he read on the PSW 10 said it didn’t have an LFE input. Looked and a few of them mentioned the same thing. Guess they figured if it isn’t labeled LFE, it just isn’t an LFE input. Thanks for all the info. Yes, I'm putting together a HT setup. I've had a "setup" all along, but it's been an out of the box, off the shelf, Onkyo 5.1 setup about 2010 vintage. It works sufficiently when weighed against any realistic upgrade since I have no viable way to update wiring or add additional speakers for examples. The living room is on the first floor of a 2 story house and the wiring was done when it was built so if it isn't in there now it's not going to be! That setup has a sub, but it's an off the shelf Onkyo setup. Not expensive. Again....sufficient for putting cartoons on for my son and low volume, 2-channel, family movie night. I acknowledge that although I truly appreciate all the stuff I consume in a theater and at home, I am not en expert in equipment. Frankly, I was ripping all my movies....even BR....to stereo because I didn't really understand it. I just kind of ripped and played. Currently I do that from a Plex server to whatever device I'm viewing on including phones etc. This HT I'm putting together now is in my "man cave". It's an open, 2nd floor loft, but I have a projector and eventually I'm going to go full Atmos. I'm a believer in buying stuff when it's a good deal, not when you need it, so it's been a long term project. I am not buying this immediately so I appreciate any more feedback! Even if I stick with a 505 at least I can learn something from your comments! lol... that or I just realized a long time ago that anything in life cheap is actually very expensive. These are probably the most popular reasonably priced sub companies. "On sub amps that are equipped with both, the 'LFE input' USUALLY bypasses the sub's own low-pass filter (sometimes called its 'crossover'), completely. And the low-pass filter setting WOULD be applied to the other pair of inputs. When connecting a sub conventionally, to an AVR's sub out, the 'LFE input' would be the preferred connection on a so-equipped amp. But if your amp doesn't have this sort of 'LFE input', and it has no sort of low-pass filter bypass switch, and you are connecting the sub conventionally to your AVR's sub out, then set the amp's low-pass filter setting to the highest possible setting. " "When using LFE, the receiver will send all the low frequencies to the subwoofer. You will have to set the xover frequency on your receiver to achieve this. So if you set it at 80hz (wich is the recommended setting for use with towers) anything under that 80hz will be handle by the sub. You have to make sure your speakers are set to "small" for this application. When using "line in" all the low frequencies that would normally go to your L / R, speakers, will be "intercepted" by your sub. You will have to use the xover frequency directly from your sub to achieve this. You have to make sure your speakers are set to "large" for this application. This method although not as popular, tend to have the same effect as not much content under 80ishHz (from a movie soundtrack for instance) would be directed to your surround back and or your center." I'll start looking around at the local papers. I'm always up for a good deal!